On Earth Day 2016, grade 8 students paid a special visit to their preschool friends for the very first Eco Buddies event. In a number of cottages, the middle schoolers set up stations to demonstrate various ecological concepts. One station demonstrated the concept of solar power by having a solar-power operated toy car move around when light was shone on it. At another station, eighth graders used a sock puppet (a stand-in for a worm) to explain Harker’s “wet/dry” waste disposal program: anything that the worm ate would go into the “wet” bin, while anything the worm rejected was headed to the “dry” bin. Other students cobbled together bird houses, made water filters and cut out makeshift helicopters that twirled to the ground when dropped. The Eco Buddies event – the largest preschool buddy event to date — was set up by preschool science teacher Robyn Stone, who is also the preschool representative of the Harker Green Committee. Emboldened by the success of the upper school STEM Buddies program, Stone decided to reach out to middle school science teacher Kristin Morgensen to help kick off the Eco Buddies program. It is notable for being the first preschool buddies program to have 3-year-olds meet students from another division. “Eco Buddies is unique because it is a program for all of our preschoolers, even the youngest ones,” Stone said. Based on the success of the Earth Day event, Stone would like to see the engagement between the two divisions continue. 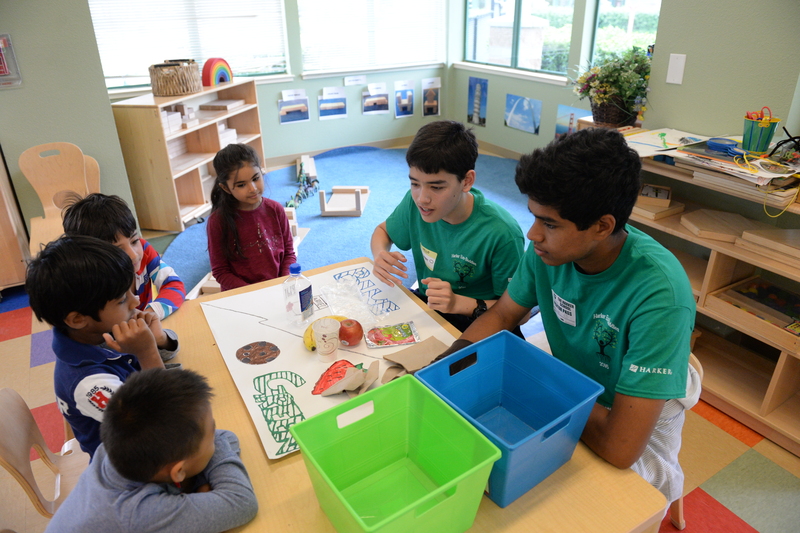 “Now that Preschool has buddy programs with the other three divisions, I hope that the older students are inspired to continue engaging in these buddy programs as they progress at Harker,” said Stone.